After the Collaborative breakfast I am moved and inspired by Lucy Ng’s visionary journey to set up the Coffee Lovers Cafe. Lucy explains that since her childhood she has been guided by her grandfather who was a “well know philanthropist in China and helped many people from all walks in life”. “It is my dream to carry on his work,” she says. Lucy graduated as a fashion designer from the University of Arts London, but “hated the industry”. Her life changed when she took up her administrator’s job with Missing Link (Metropolitan) a peer supporter service empowering the lives of people moving on from hospital wards into the community. “I went through depression myself with three kids alone but didn’t know much of mental health,” says Lucy. “But after Missing Link I made many friends and I learnt that something needed to be done. “Many peer supporters had so much experiences and we know peer support works! I wanted to carry on doing what I love and with my partner (ex peer supporter) by my side – we were on a journey to find a cafe. The place was “a rot” says Lucy, and many friends, including ex Missing Linkers and people from the Crisis Bermondsey project helped and contributed in painting, cleaning, building and resourcing. “It was a journey and step by step we made it to today. The cafe offers free exhibition space to SHARP (South London & Maudsley, SLaM’s recovery programme) as well as discount for people from hospitals or within the Lambeth Living Well Network. 6 to 8 pm, who also gives support to members of the public with interest and enquires for friends and love ones. The cafe is a mine of information about the Living Well Network, other support groups, organisations, local projects, events and much more. Others who visit include the Larkhall mental health gardeners, Thrive and Lucy’s local church St Stephen’s, while a neighbouring mental health film maker makes short films following the stories of people through their journey and experiences. “Mosaic Clubhouse (hosts of the Living Well Partnership in Brixton) is our great supporter and a regular here. Members come here and feel part of it – which they are,” adds Lucy. “They bring people from hospital for tea, so they can be in a safe public cafe to enjoy their day out.Locals alike are meeting up here and with members from Mosiac to talk and get information. Lucy says that since May 2013 her business plan was to be a cafe where locals could come and meet, and enjoy this relaxing space. As well as this Lucy wanted a place where locals could “engage and understand more about mental health and well being. This cafe is a platform for new learning and changing attitudes for the better,” she emphasises. “We are here to catch anyone who is near to falling into poor mental health because we understand. People care and we have the support here, along with other information for others to help and support. “People need to know who and what the Collaborative is and does,” adds Lucy. “We can can bridge and connect locals by holding events like the Collaborative breakfast, that took place here on the 12th March. There was lots of talking and enquires after the meeting ended. “Locals see that the people at the top are working and connecting in a local area. That is front row seats for people. Invite locals next time to the meeting and get them to participate. Get their views and listen. 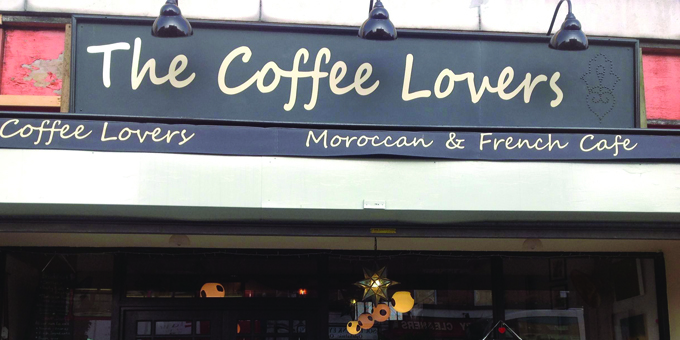 The Coffee Lovers Cafe is at 268 Wandsworth Road, London, SW8 2JR.